Get your local online presence up to snuff with local SEO. A prospective client recently came to me with the following problem: local search results were virtually non-existent. First, let’s just say this. That the business owner has a website is a leg up over the competition. I continue to see statistics suggesting that fewer than 50% of small businesses have websites. To me, that seems incredible in 2014. On the plus side, that’s a lot of potential business for the Goat! So much business is local! If you have a local business, and a website, you need to indicate your location on your site and online business directories. But what if you have no business physical address? Many local businesses, and especially those providing services rather than goods, work out of the home (or serve customers at their own locations). That was the case with this individual, and he could not figure out how to provide information about local location without divulging the home address, something he was reluctant to do, and something we’d recommend avoiding. Here’s one solution. Get a mailbox at a mailbox store or local post office (Yes, USPS offices do this; it’s called “competitive street addressing”. ) . Such locations will usually permit you to use their street address for snail mail (e.g., 123 Main Street #195). On your website, you may indicate that the address is for mail. On online business directories (Google+, Facebook business pages, Yelp, etc.) indicate that as your address. Note, however, that it may violate the policies of some online business directories to indicate as your business address an address where your business is not physically located. Google+ permits you to avoid this potential problem by indicating that it is not your physical address, but rather a point a certain radius from which you serve customers. So you are misleading no one about your physical address; you are simply not indicating where your actual business physical address is. And yet you can have a better chance of showing up in local searches because now Google knows where your base of operations is. Consistent NAP. We’ve written about this a lot. You have to be consistent with the name of your company, address and phone number. NAP. If you use commas, always use them. Hyphenate your phone number? Don’t use periods sometimes. Have multiple phone numbers? Use one consistently for directory listings. Always be consistent with your NAP. Always. Else the Internet’s computers start to think you are more than one entity. Prominent display of contact info on site. This should go without saying. Make sure it’s easy for people to find out how to contact you when they are on your site. Don’t be cute about location. Don’t put rows of zip codes or town or county names in small gray text at the bottom of pages. It looks terrible, and eventually the search gods will punish you for that. Claim and correct (or create) listings on all major general online business directories, including Google+, Facebook, Yelp, Manta, MerchantCircle, Angie’s List, Yellow Pages, Bing. There are others. This takes time. You might try Moz Local to start. Claim and correct (or create) listings on major online business directories specific to your industry. If you’re a lawyer, for instance, take control of your listings on avvo, findlaw, lawyers.com, and etc. Mark up data on your website with schema.org data. See https://schema.org/LocalBusiness. This tells search engines about where you are so they can display information about your business in specialized ways on their sites. Are you getting found locally? Note this local SEO practices change over time. This quiz was originally published in January 2015. Now go get found in your locale! What did we forget? Leave a comment below. 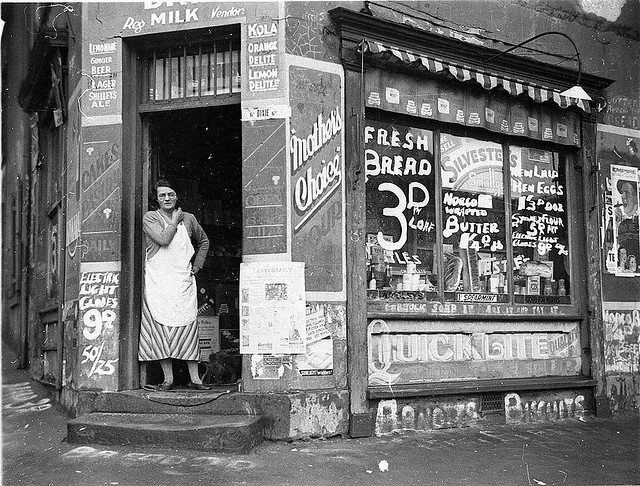 Image Source: “Depression “bread wars”, corner store on Bourke & Fitzroy Streets, Surry Hills, Sydney, 21 August 1934 / Sam Hood” by State Library of New South Wales in Flickr Commons. GoatCloud helps businesses and nonprofits to get found locally. Hi Clifford- Great post. Quick question; do you think it’s best to have contact details i.e. address etc on every single page in the footer or to stick to just one standard ‘contact us’ page? Great question, Maria. I think you have to balance aesthetics and functionality and, importantly, it also depends on what type of business the website is promoting. Retail operations that depend on foot traffic would probably do well to make physical address as easy to find as possible, because location (along with hours of operation and phone) is key to driving human traffic into the shop. I might also suggest looking at your website traffic to identify what percentage is mobile. It may be that a “tap to call” phone number suffices in the footer.